Armenian Legacy in America: A 400-Year Heritage is dedicated to the 400th anniversary of the arrival of the first Armenian to America. The book is an illustrated edition with 620 pages and more than 2200 photos, including artifacts, documents and rare images demonstrating the history and legacy of the Armenian-American community and the important contributions of the Armenian community to the American homeland. The volume is the first attempt to present a concise illustrated history of the American-Armenian community. It comprises materials from Armenian institutions of both the Republic of Armenia and the United States. Most of the materials and visual data are published for the first time. Book chapters and illustrations are presented in chronological order, covering the time period from 1618 until the early 1990s. The book has been published through the generous support of the Noubar and Anna Afeyan Foundation on behalf of the Aurora Humanitarian Initiative. 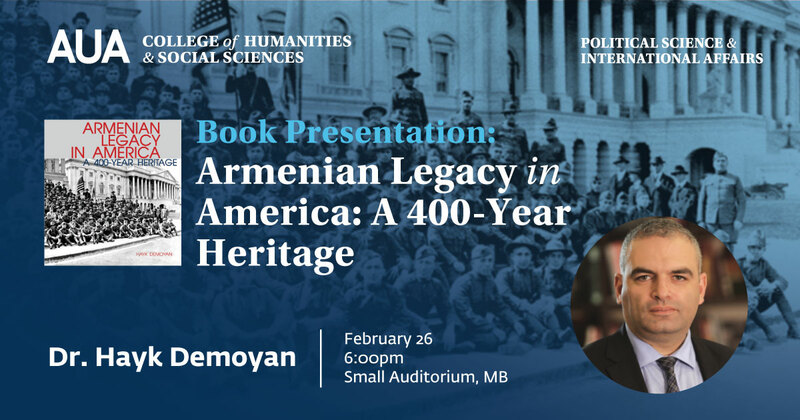 Dr. Hayk Demoyan was the Director of the Armenian Genocide Museum and Institute (AGMI) in Yerevan, Armenia from 2006 to 2017. Currently, he serves as the Chief Operational Officer of the Aurora Humanitarian Initiative.